Monk Parakeets get their name from the distinctive cowl over their heads. They're also known as "Quaker Parrots." Monk parakeets are adaptable to cold weather. They build nests on power lines near transformers to stay warm. Kevin Burgio remembered the first time he saw monk parakeets. He was out bird watching "and I ran across this puddle that had like five or six monk parakeets drinking from it," he said. "I'm like, what the hell is that? Did someone lose, like, five parrots? I didn't know there were parrots here." Burgio, a PhD student in ecology and evolutionary biology at UConn, said no one is sure how monk parakeets first got into the state. The birds are native to sub-tropical South America, but they get shipped worldwide as pets. "If you adopt a parrot, especially this kind of parrot, it's kind of like adopting a two year old who's really loud and has very destructive tools built in," said Margaret Rubega, the state's ornithologist. "[It's] going to live to 30 -- and will be two years old the whole time." 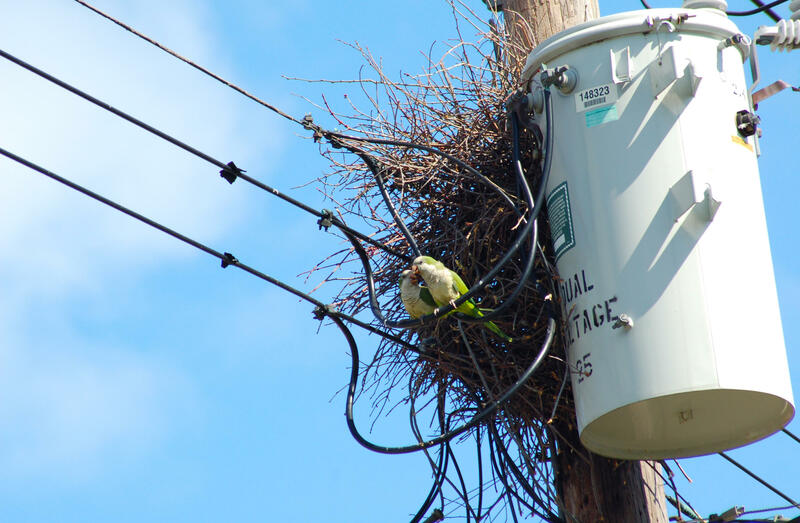 Monk parakeets have caused problems for utilities by building nests near electric transformers. I met Rubega and Burgio at an intersection in New Haven to observe some monk parakeet nests. The birds are green and about the size of a robin. There also very, very chatty, which leads some owners to release them into the wild. That's where problems begin. In addition to being loud, monk parakeets are highly adaptable to the Connecticut's cold weather. They often build large nests on power lines near transformers, which they use as a kind of home heating system. That causes safety and power-reliability concerns for utilities, which sometimes destroy the nests or kill birds. "People have tried all kinds of things," Rubega said. "They've tried to figure out ways to wrap the whole pole so they couldn't get started. They've tried putting up plastic owls and eventually, the birds end up perching on the owls' heads. They've tried bird contraceptives." These are fixes Rubega said are all too complicated to really work. Monk parakeets are found all over the world, with populations in the Americas, Spain, and Israel. Kevin Burgio started looking for a simpler solution. He began driving around the state staking out nests to learn more about monk parakeet behavior, and how they built their homes. "If you're sitting around in your car, with a bunch of cameras and binoculars and scopes, taking notes, people are going to ask what you're doing," he said. "In fact, I've had people threaten to call the police on me and I have to tell them, 'Oh, no -- I'm just looking at the birds, I swear!'" 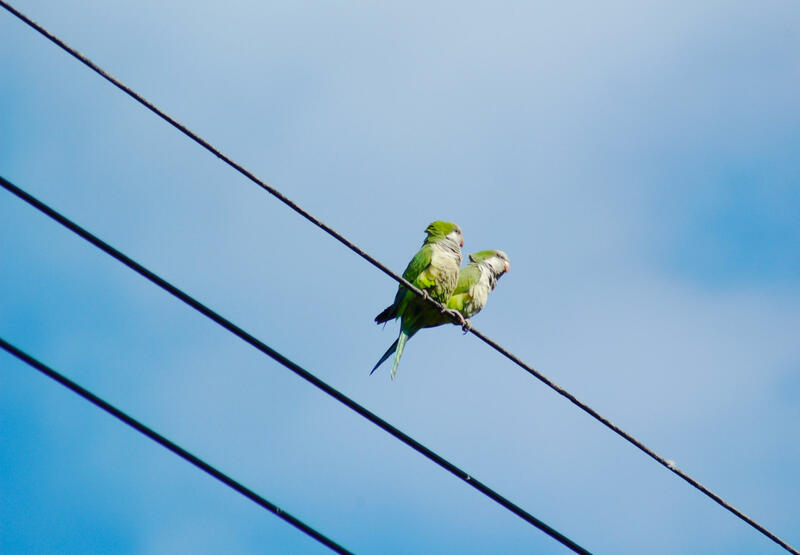 In his paper, Burgio and his team observed more than 400 parakeet landings across 19 utility poles. 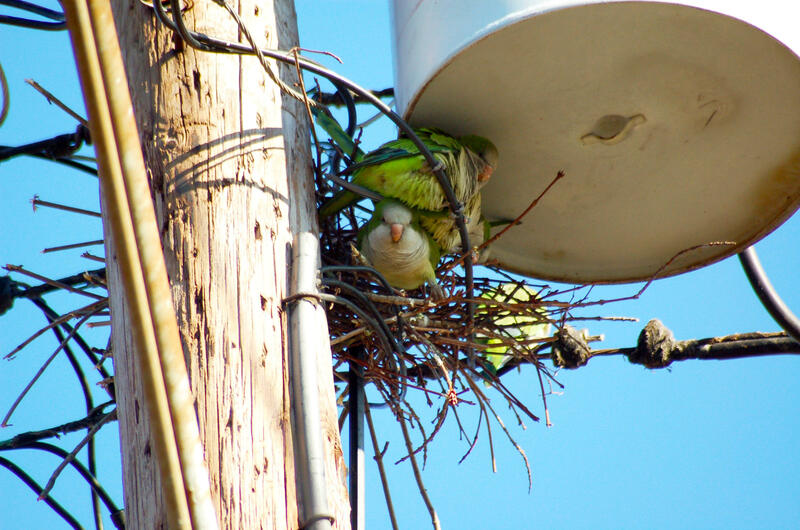 He found that in the early stages of nest building, monk parakeets landed exclusively on power lines adjacent to utility poles, not on the poles themselves. That led him to his next insight: "If they can't walk on the lines there, then our thought is that they can't start building the nest," he said. Burgio said he's at work with a manufacturer to develop and test a device that will prevent monk parakeets from landing on power lines. The fix won't entirely solve the problem of noisy neighborhood parakeets. If utility poles are off-limits, the birds will likely move to adjacent trees. Burgio hopes his work will at least reduce the threat posed to power by the birds. His paper appears in the journal PeerJ.